Fast monitoring of keyword position changes using Website positions. The section Website positions shows keywords and positions for the selected date range added to the project. Click Add Keywords in the section Website positions. Add more keywords each in a new line in a new dialog box. 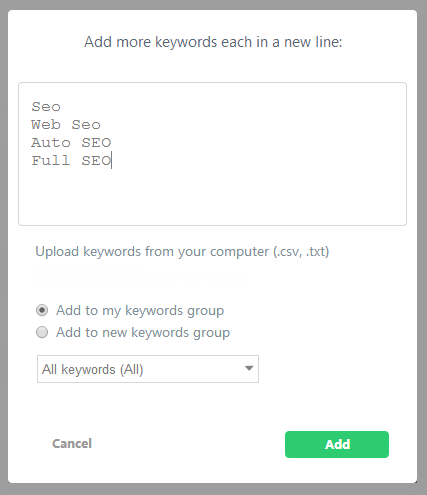 You can also upload keywords from your computer (.csv, .txt). 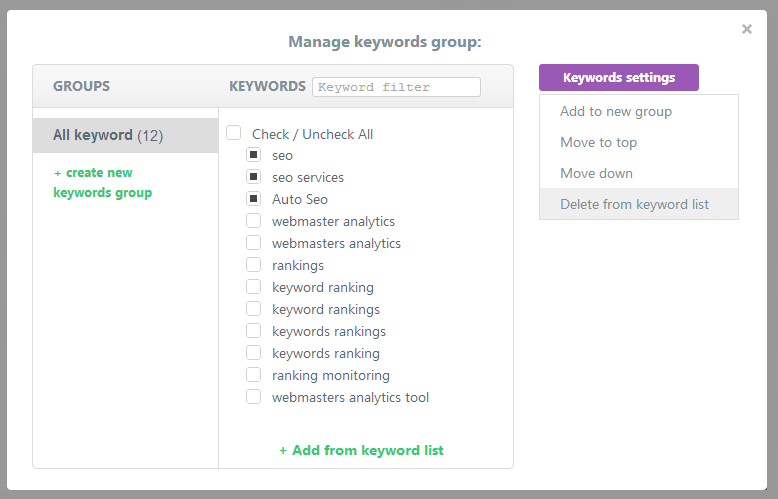 Select one of these items: Add to my keywords group or Add to new keywords group (Choose a new name for the selected keyword group). Click Add. New words will be added to the existing Keywords list and will be displayed at the bottom of this list. In order to find the required word quickly enter it to the search bar - Keywords filter. Semalt performs the analysis of your keywords over the first 10 pages of Google search engine – the so-called Google top 100. The figure “0” means that the keyword being analyzed doesn’t belong to Google top 100. The symbol “---” means that your keyword used to have rankings but it was eliminated from Google top 100. Any other figure (1-99) stands for your website position in the Google search results. 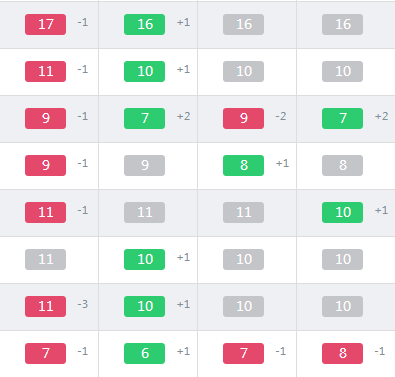 The color gray means the keyword you use doesn’t change the positions compared to yesterday. As you may notice the figures next to the green and red fields show the number of positions you gained or lost compared to yesterday. How to change the keywords order. Click Keywords settings in the section Website positions and select the item Move to top or Move down. The keyword order in the selected project has been changed. The words selected by the user will be displayed at the beginning or in the end of the keywords list. Click Sort by in the section Website positions. The order of keywords for the selected project has been changed according to the user’s choice. Click All rankings in the section Website positions. How to delete keywords from the project. 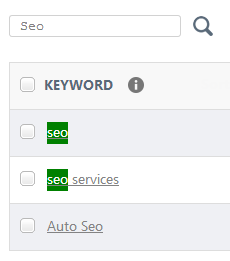 Click Keywords settings in the section Website positions and select Delete from keyword list. Confirm your decision to delete the selected keywords from the project by clicking Yes. Check the checkbox next to the word or group of words you want to delete. Select Delete from keyword list in the section Keywords settings. Once you confirm your decision to delete the selected keywords from the current project, all these keywords together with their history will be irrevocably deleted from the project.